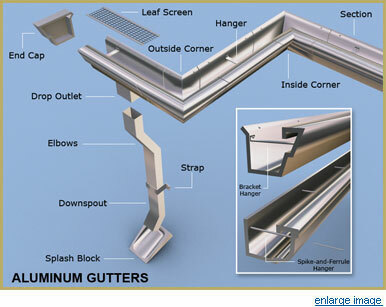 Rain gutters are an important and essential part of protecting your home. During storms and downpours, gutters work to draw the water away from your home and help it drain properly. A properly installed and maintained rain gutter can save countless hundreds and even thousands of dollars in roofing, facia, siding and foundation repairs over the years. Though you may not think it, there is a wide variety of selections available when it comes to rain gutters. Seamless, bonderized, copper, aluminum, steel…the choices can be overwhelming. When considering which rain gutters to purchase, keep maintenance, style and materials in mind. You’ll want the style and color that best fits your home, but also consider maintenance and the best materials for the job. Vinyl gutters are less expensive in the beginning, but they warp, fade and, in general, don’t stand up to the elements as well as steel, aluminum or copper. other gutters, isn’t available in a seamless variety and is still susceptible to rust. With their years of experience, Gutter Masters can help you choose which style, color and variety of gutters will not only add to the beauty of your home, but protect it for the long term as well. Give Gutter Masters a call today and let them help you.